One day after no less than three on-field incidents between the New York Yankees and Detroit Tigers, including one benches-clearing brawl, Major League Baseball handed out its suspensions for the incident. Altogether, four players, as well as Tigers manager Brad Ausmus, were suspended. 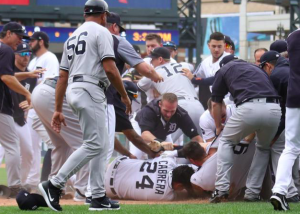 The list is highlighted by Miguel Cabrera, who threw the first punch that incited the brawl, and Gary Sanchez, who was also at the center of things both before and during the fisticuffs. Cabrera received a 7-game suspension, the most of any player. Soon after Yankees reliever Tommy Kahnle was ejected for throwing a pitch behind him, Cabrera pushed Yankees catcher Austin Romine before landing a couple punches. From there, a melee ensued with both benches clearing. The harshest suspension for a Yankees player went to Sanchez, who received four games. Tensions between the two teams reached a boiling point after Sanchez was hit by Michael Fulmer. However, Sanchez earned his suspension by throwing punches during the brawl. “Things got out of control pretty quickly there. I went out there to defend my teammates. That’s what it is,” said Sanchez. However, if you ask the Tigers, Sanchez got off easy with only a four-game suspension. Detroit reliever Alex Wilson also received a four-game suspension for purposely hitting Todd Frazier. Ausmus was suspended for one game on account of Wilson’s actions. Finally, Romine received a two-game ban. He was locked in a verbal altercation with Cabrera right before the brawl started. He was livid at being ejected afterward and maintains that everything he did was done in self-defense. Kahnle, Yankees manager Joe Girardi, bench coach Rob Thomson, outfielder Brett Gardner, and Tigers shortstop Jose Iglesias were all fined an undisclosed amount. New York’s Garrett Cooper and Clint Frazier were also fined for stepping on the field while on the DL. Interestingly, Kahnle, Fulmer, and Dellin Betances were not suspended after all three pitchers hit a batter during Thursday’s game. All four suspended players have said they will appeal, allowing them to play until their appeal is heard. For Cabrera and Wilson, missing time is no big deal outside of the salary they stand to lose. However, losing Sanchez for four games and Romine for two games could hurt the Yankees, as they chase a playoff spot. The Yankees currently trail the Red Sox by 4.5 games in the AL East but hold a 3.5-game lead atop the wild-card standings.